Although we haven’t closed on our house yet, I’ve been dreaming about all of the projects I want to do once we move in. One of the first things that will happen is that I’ll pick paint colors for the rooms. In our Illinois house, I used gray in all but 2 rooms and loved the way they turned out, so I’m hoping to use them again in our new house. I know that lighting is different in every house, and I won’t truly know what will work until we’re in and I have paint on the walls, but I have some ideas about what I’ll try. 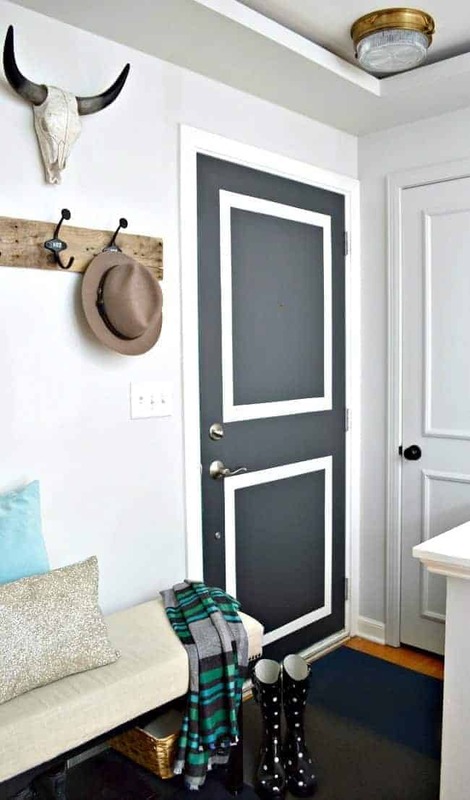 There are literally thousands out there but here are my picks for 7 great gray paint colors. Some are favorites that I’ve used and the rest are colors that I always find myself pinning, but they’re all pretty fabulous. Benjamin Moore Gray Owl – My favorite gray! I used this color in several rooms in my last house and loved it so it’s definitely a top contender for the new house. 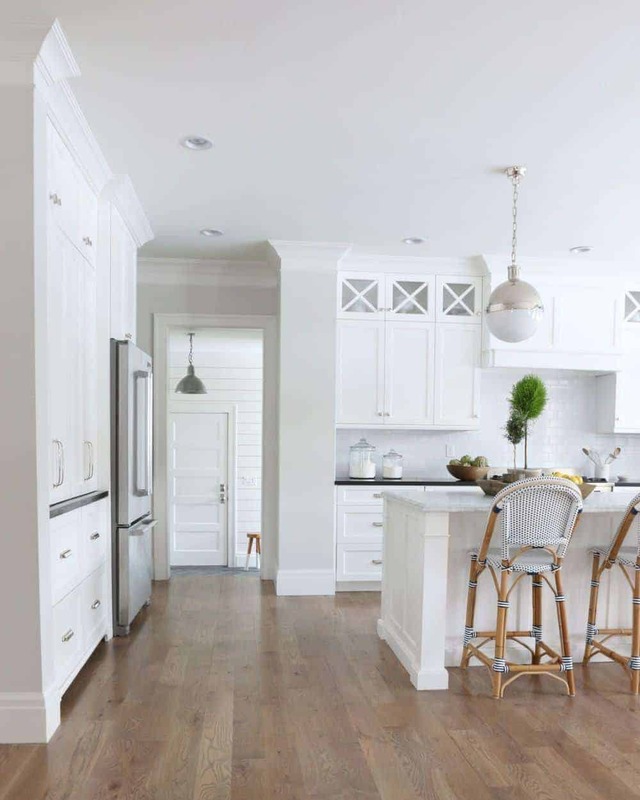 It’s a warm gray that has more yellow in it than blue and worked well with the trim, ceilings and kitchen cabinets that were painted with BM White Dove. I’ve used it full strength, in the original formula, and at 50% strength and loved them both. 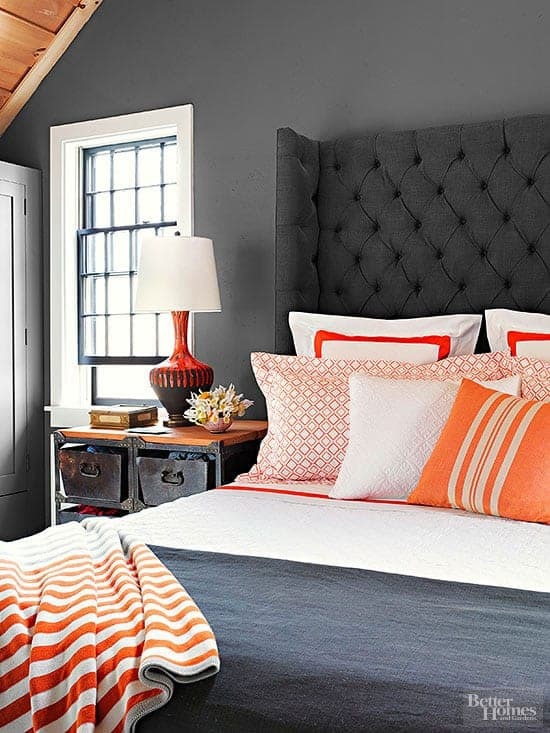 Benjamin Moore Kendall Charcoal – a beautiful and versatile dark gray that works with almost everything. 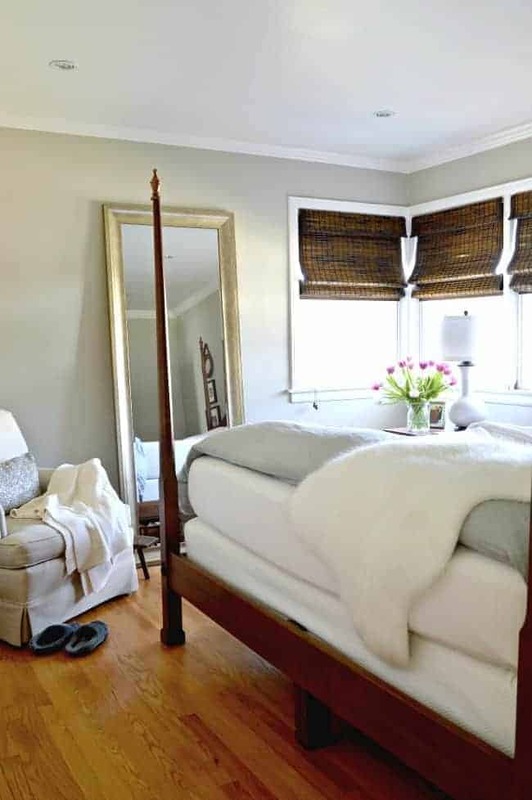 Benjamin Moore Balboa Mist – a soft warm gray that has a slight purple undertone. Benjamin Moore Wrought Iron – I love this color and used it on the interior of both my front and back doors in our Illinois house. It may look black but it’s a gray/brown/black that is less harsh, and it pairs well with BM Gray Owl. 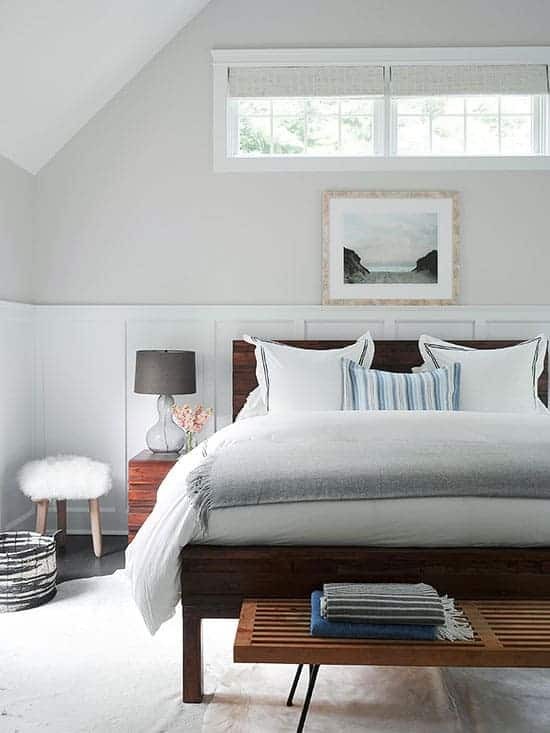 Benjamin Moore Classic Gray – this is a pale neutral gray that has warm undertones. 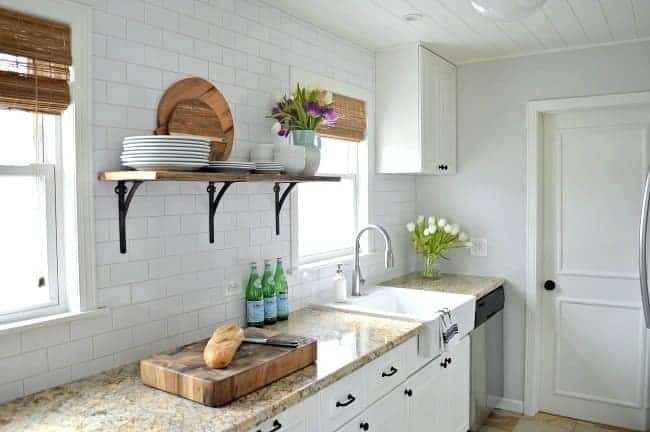 So pretty in this bright and beautiful kitchen. Image via Studio McGee. Benjamin Moore Hazy Skies – I used this pretty gray-green in our Illinois master bedroom. This room didn’t get a ton of light so the color was more green than gray. BM Edgecomb Gray – A soft, warm gray/greige that looks best in a room that gets tons of natural light. Of course, this is just a (very) small sampling of great grays. The only way to know what works best in your space is to sample it in your room. Two important things to remember about paint…it can easily be changed if i doesn’t work and it can make the biggest impact in your room, it was definitely a game changer in my kitchen. What do you think about gray paint? Do you have a favorite or have you moved on? 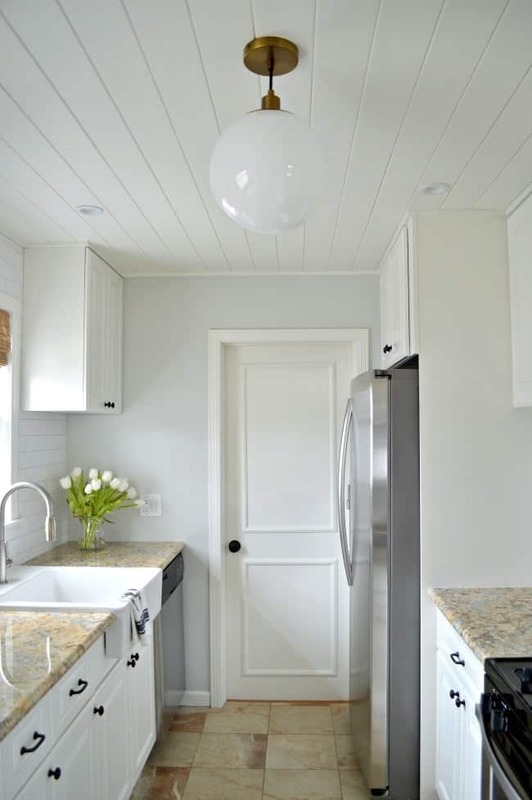 Check out my small kitchen that was painted with BM Gray Owl. Our front door painted with BM Wrought Iron. For more paint inspiration, easy DIY’s and behind the scenes fun, make sure you follow me on Pinterest, Instagram, Facebook and Twitter! I have BM hazy skies for trim. Looking for wall colours on the light side that will go with this trim. Original was Chelsea grey but found that way to dark. I used BM Hazy Skies in a bedroom in our Illinois house. It is a pretty color. 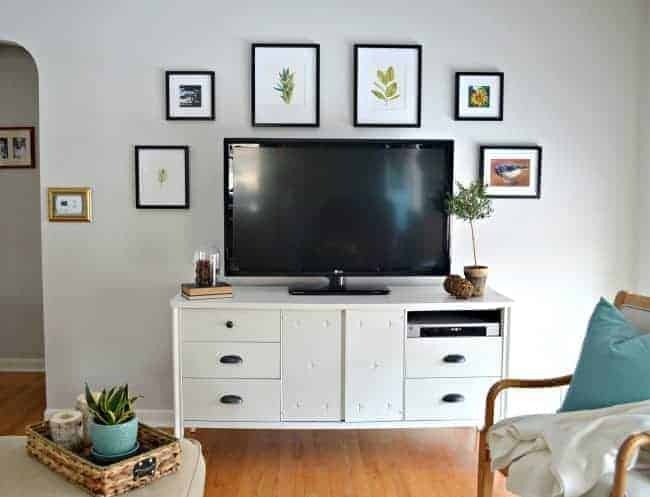 Are you looking for a light gray color for the walls? Yes light grey would probably be best. I just don’t know what. It will be for bedroom so what to keep it light. I find the darker colour will make room feel smaller. Swiss Coffee would be a good choice. I would get a sample and paint a piece of poster board. Put it next to the Hazy Skies in the room that you want to paint. We are looking at paint colors for our home interior. We have white (Swiss coffee I think) with slightly brighter white trim. I love your BM Gray owl at 50%. I don’t love really warm colors. Can you tell me what color White you used for the trim? I’ve always had white walls, so I’m a little gun shy. Our home is small and I want a color that makes it feel big and brighter. Hi Dawn! I have a small house, too, so I understand why you want to make it feel big and bright. 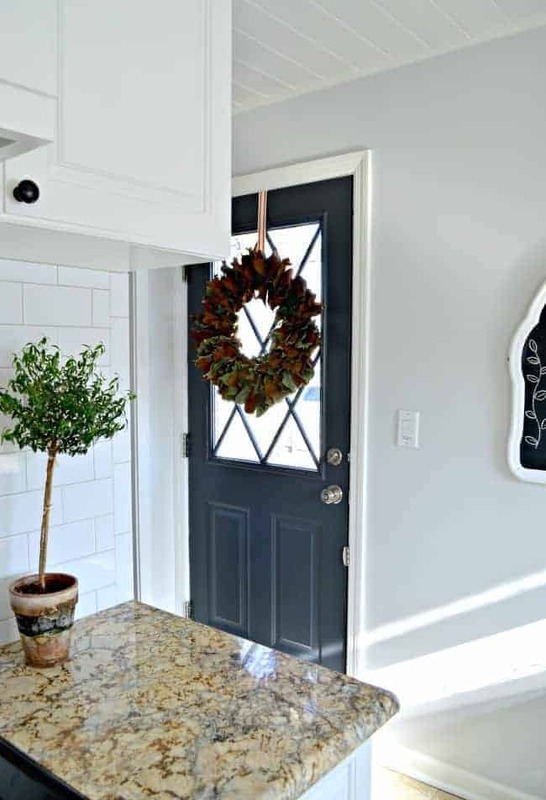 I have used BM Gray Owl a lot in our cottage and our last house in Illinois and our trim and doors are painted with BM White Dove. It is a slightly warm white but that is what I was looking for. I even painted my kitchen cabinets in it at our last house. If you want to take a peak you can see it here. https://www.chatfieldcourt.com/diy-kitchen-remodel/ I also used it on the ceiling, doors and trim, but used in different sheens. Just to note that the walls in the kitchen are painted in BM Gray Owl and I think that both colors work well together. If you want something that’s more bright white you can try BM Decorator’s White or BM Super White. Hope this helps. Hi Susan. I think that going gray in your bathroom would look beautiful. I’m partial to Gray Owl but Classic Grau would look great too. I have been going 50% lighter with Gray Owl and I’m thrilled with the softness of the color. Let me know what you decide. I would love to see pictures. I have colonial blue on trim ,molding , etc with zero hopes of ever getting it changed . Zilch . Do you think maybe I could use a gray on walls ? Hi Dee. I think that you could absolutely use gray on your walls. I don’t know the exact color of your trim and the lighting in every house is different, but I think a very light gray would look awesome. I would get a few samples and paint a piece of posterboard, you want a large swatch, not the little squares that you get in the paint store. Once you have your swatch, put it right next to your blue molding and leave it for a few days. Look at it in daylight and at night and you should be able to tell if it works for you. Good luck! I would love to hear how it turns out. Very pretty choices. I bet you can’t wait to get started on the new house! I agree on gray. I think it is a great neutral color. I am NOT an beige or earth tone person. I can’t think of any color that can’t be used as an accent color except beige! So true Rose. I used to be a beige girl but once I went with gray everything changed. Can’t wait to do it again in our new house. I am having a very hard time choosing grey! My samples turn out blue! Or beige! I just want grey! A medium color, then a light white/grey for my bath. Help please! Hi Jan. I’m sorry you’re having a tough time finding a gray paint. I’ve been there myself. My first question would be how are you sampling them? Are you painting over an existing color? I usually put my swatches on a piece of poster board and put it in different places in the room at different times of the day. Also, what colors have you tried? I’ve heard that BM Stonington Gray is a beautiful medium gray (as close to gray as it can be). Hope some of these suggestions help. Let me know if you have any other questions. Thanks for posting all the gray pictures of your rooms. We are in the process of getting the house ready for sale. This is our 6th move in 30 years. 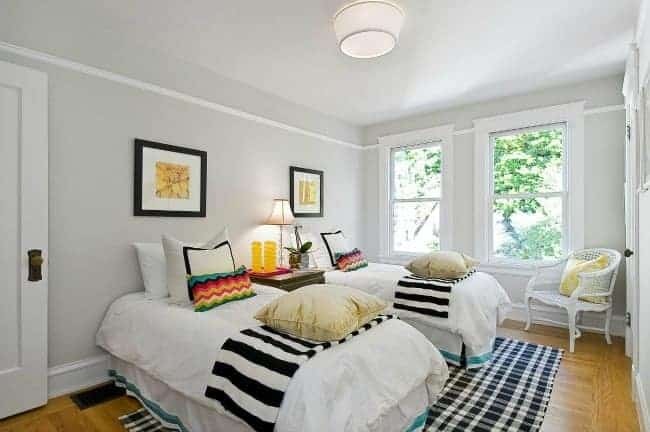 A couple of the bedrooms need painted and I have been thinking of gray but was a bit hesitant. Your inspiration is helping me move forward on the choice of which gray! Always up for a new adventure! I’m glad that my post inspired you to move toward gray. It’s not a color I ever really used before, but once I started using it in our last house, I saw how versatile it could be. 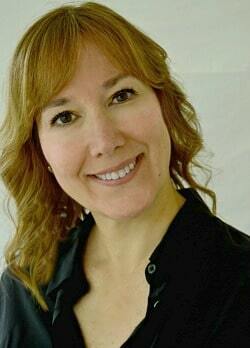 It worked well for us because we got an offer on our house 12 hours after it was listed. Best of luck with your move.